Join your fellow nonprofit colleagues for the first earned income series in Central Florida! Come explore and discover your organization’s revenue-generating opportunities to diversify your support base and meet the growing demands of your nonprofit. 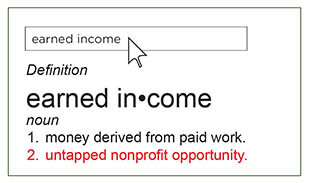 Explore Earned Income is a four-part series in partnership with No Margin No Mission to help nonprofits explore new avenues of sustainable funding. Your team: Three individuals from your organization must attend each part of the series including the executive director and a board member. Though not required, it is highly recommended that the same three individuals attend each session. Lab Two: Exploring earned income possibilities…identifying opportunities to do good and do well. Lab Three: Ready for Earned Income? 5 Important Characteristics to Consider Before Jumping In. Lab Four: Business Planning for Nonprofit…Developing a blueprint for earned income success. Click here for complete descriptions of the workshops and learning objectives. After completing the series, you will have an understanding of what it takes to start an earned income program at your organization. Note: If possible, please register all three attendees at once by using the "Save and Add Another Attendee" button. Larry Clark is passionate about social change, which fueled his desire to cofound No Margin, No Mission in 2011. He recognized the need for entrepreneurial thinking and leadership in the health and human service sector through his many years of experience working with nonprofits and foundations across the country. With a career that spanned nearly 30 years at Seattle-based Comprehensive Health Education Foundation, Larry is widely respected as a pioneer in the social enterprise movement. Through his extensive work in philanthropy and with health and human service organizations, Larry is nationally recognized by both sectors as a cutting-edge thinker and innovative leader. He is a frequent and distinguished speaker on topics pertaining to social enterprise and entrepreneurial thinking in the nonprofit sector, and has developed unique expertise in income generation, intellectual property development, and strategic partnerships. Larry has been active on several national boards representing a combination of foundations, community-based organizations, and coalitions. He recently served on the Alliance of Nonprofits Board and Center for Social and Emotional Education Advisory, and has also served on the boards of Grantmakers in Aging, Community Anti Drug Coalitions of America, the Social Enterprise Alliance, Philanthropy Northwest, and the Local Initiative Funding Partners Advisory for the Robert Wood Johnson Foundation. Larry earned his BS in Community Health Education from Western Washington University in Bellingham, Washington. Michael Oxman believes in the power of innovation to transform the social sector, which inspired him to cofound No Margin, No Mission in 2011. A self-described entrepreneur and business leader with a strong desire to create a better world, he embraces opportunities to help organizations build a lasting future so they can achieve greater mission impact. Michael's talents have been widely embraced by nonprofit and philanthropic leaders nationwide. Michael's extensive experience in both for-profit and nonprofit entrepreneurial ventures has earned him respect nationally as a subject-matter expert, consultant, and speaker on topics pertaining to earned income generation, business planning, organizational growth, as well as brand and marketing strategy for nonprofits. With consulting experience that runs broad and deep, Michael's portfolio of client engagements covers a wide range of health and human service organizations, as well as philanthropies. Prior to founding No Margin, No Mission, Michael was an advertising and communications senior executive at Euro RSCG Worldwide in the firm's Chicago office. During his time there, Michael led strategic brand development for Walgreens, one of its largest clients, and also initiated his strategic work in the nonprofit sector for Comprehensive Health Education Foundation (C.H.E.F.). Prior to joining Euro RSCG, Michael worked as Senior Vice President at D'Arcy Masius Benton & Bowles in its Detroit office, leading strategic brand development for the Cadillac Motor Car Division of General Motors. Earlier in his career, Michael held executive positions at other leading advertising agencies, advising large clients on brand strategy such as Chiquita Brands Worldwide, The Iams Pet Food Company, and The Stroh Brewery Company. Michael has served on several Chicago-area nonprofit boards, including Ravinia Music Festival's Ravinia Associates and Northwestern University's Medill School of Journalism. Michael earned his BA in Journalism from the University of Wisconsin-Madison and his MS in Advertising from Northwestern University's Medill School of Journalism in Chicago. E-mail Karen Revels at krevels@rollins.edu for more information about sponsorship opportunities. All lab series registration cancellations and refund requests must be submitted in writing to ebi@rollins.edu by January 25, 2019. A refund of lab series fees paid minus a 10% processing fee will be given for cancellations received by this date. No refunds will be granted for requests received after this date. No refunds will be granted for no-shows. All requests for exceptions to the cancellation/refund policy must be submitted in writing to ebi@rollinse.edu by the registrant with appropriate documentation no later than seven calendar days following the start of the lab series (February 7, 2019). After that time, no refund considerations will be made. Registrations may be transferred to another person from the same organization by submitting a written request to ebi@rollins.edu.